Calla is the alpha female of a shape-shifting wolf pack. She is destined to marry Ren Laroche, the pack's alpha male. Together, they would rule their pack together, guarding sacred sites for the Keepers. But then, Calla saves a beautiful human boy, who captures her heart. Calla begins to question everything - her fate, her existence, and her world and the orders the Keepers have asked her to follow. She will have to make a choice. But will she follow her heart if it means losing everything, including her own life? Nightshade was one of those books I've had my eye on for years. I kept taking it out from the library but never managing to read it. Finally, I decided to purchase the first two in paperback, and wait to read them until the third one was out. I'll admit to being slightly disappointed when I finally read it. The concept was great, the characters had potential, but the overall product wasn't as stellar as I thought it was going to be. Okay, the first chapter of this novel? Fan-freakin-tastic. I was hooked. What a great opening! I wanted to know more, to find out what in the world just happened. I wanted to learn more about Calla and this human she saved. It was a grabber. As the story progressed I continued to be intrigued. I could see all the secrets and twists this plot was bound to have and I was ready to unravel them. For the first hundred pages, I was loving it. And then my love started to deteriorate and although the last twenty pages had me gasping, the middle chunk left much to be desired. The main reason I was really irritated by the novel was this: I guessed the ending. Pretty much a hundred pages in. It wasn't that I figured it out cause I'm clever, it was just very obvious where the story was going. So, as the characters spent the next three hundred pages wondering what was going to happen, I sat there shaking the book thinking "It's right in front of your face!" Maybe I wouldn't have guessed it had I been in Calla's shoes, maybe. But considering she was running through all the possibilities, one would think THAT possibility would come into play. So, for me, the suspense of "what's going to happen" was more of a waiting for the inevitable. And that really lessened my excitement for the book. As did the love triangle. Don't get me wrong, I really love a good love triangle. And this one has huge potential to be. But, I kept flipping back and forth between loving Ren and Shay to being irritated with both of them. Both had some seriously swoon-worthy moments, and both had some shake-your-fist-at-them moments. I couldn't decide if I enjoyed the love triangle or not. It was kind of mixed. Calla I also had mixed feelings about. I knew she would make me proud, and she did, but getting there took a bit of time. I absolutely LOVED Bryn and Ansel. They were two of the cutest characters! I loved every scene they were in. I loved the packs' banter as well. It constantly made me smile. I was also huge fans of the Keepers (and no, not as in I wanted them to win). They were devilish villains and a great addition to the story. Characters you loved to hate, and made great antagonists. 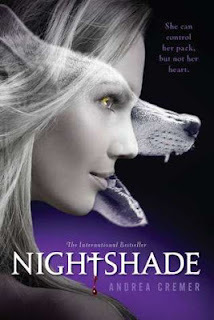 Now, don't get me wrong: I enjoyed Nightshade. I'm really excited to read the next two, and think it has amazing potential to be great. I think all of these characters need is growth. They need to grow as people and change as characters. I'm not huge fans of them now, but they have the ability to make me love them. And I'm very ready to love them. The concept itself I absolutely love. It's well thought out, intriguing, and heart-wrenching. I'm really excited to read more about it, and see how the characters adapt and react. I may have had some issues with the book, but I did enjoy it. I may have known what was going to happen, but I was still committed to the book and the characters inside of it. I am happy I read it, because I have a feeling I'm going to love the series. Had a rocky start, but I'm sure I'll be a committed Nightshade fan by the end.